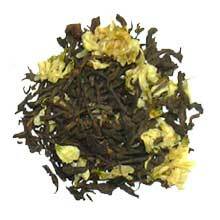 This special blend of Pu-erh with Chrysanthemum flowers is very popular in Hong Kong. It is commonly served in many Chinese restaurants, especially during a Dim Sum meal. Not only is it delicious, but it is considered particularly good for cooling internal heat, as well as being able to aid digest the oily food. To ensure freshness, we will only create the blend when we received an order for this tea. The sweetness of the Chrysanthemum flowers nicely complements the earthy taste of Pu-erh, creating a healthy and soothing tea with a subtle sweet floral fragrance. This tea is highly recommended for those who are new to Pu-erh. Mixture of dark Pu-erh tea leaves and chrysanthemum flowers. When infused, the chrysanthemum flowers will float atop the water.